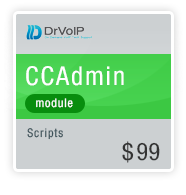 This is an optional module to the ;DrVoIP Generic Call Queue base line script and enables supervisors to call into an additional Script that will prompt them for a User ID and Password. Once authenticated, they can Open or Close a Queue as well as record a new prompt by prompt number. This script requires the setsettings.aef and gesetings.aef which is included. Support or implementation assistance must be purchase separately.